As you know, I went to Russia. And I loved it. The food was surprisingly varied and the quality was always good from the smallest cafe to the largest restaurant. When ever I travel I endeavour to make good food choices and so I was on the look out for vegetable-based dishes on the menus. In our favourite spot just near the hotel, we ordered the Russian Salad and it was amazing. I’d never had Russian Salad before, and to be honest I thought it was probbly something made-up by some guy in America somewhere, but it turns out to be a genuine Russian dish. 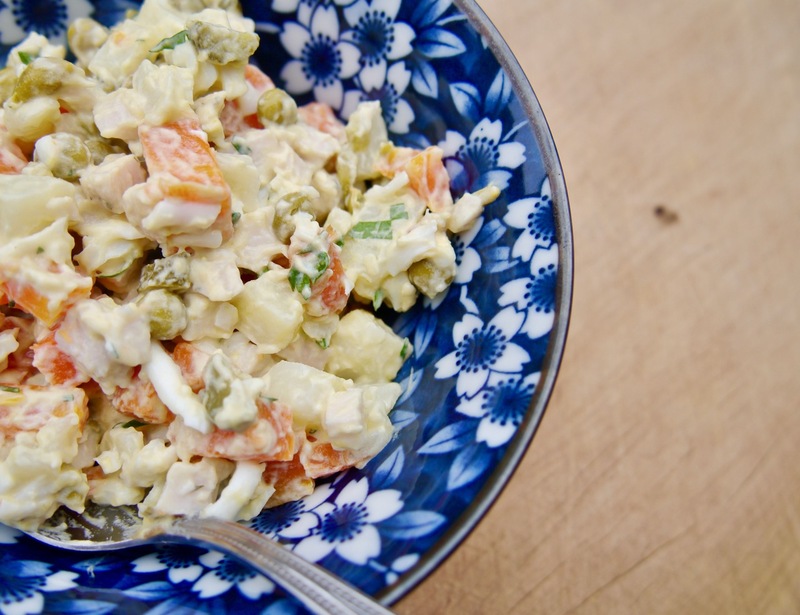 Devised in the 1860s by Belgian cook Lucien Olivier, the chef of the Hermitage, one of Moscow’s most celebrated restaurants, Olivier’s salad became popular with Hermitage regulars, and became the restaurant’s signature dish. The recipe was of course kept secret for a long time until it was stolen and inferiorly reproduced and then willingly sold and published. It’s now served as a celebration dish all over the world, and in particular, a new year’s day favourite for Russians. One of the first printed recipes for Olivier salad, called for half a hazel grouse, two potatoes, one small cucumber (or a large cornichon), 3-4 lettuce leaves, 3 large crayfish tails, 1/4 cup cubed aspic, 1 teaspoon of capers, 3–5 olives, and 1​1⁄2 tablespoons of Provençal dressing. As with many gourmet recipes, it was eventually altered to accommodate more readily available, cheaper ingredients. That said – use this recipe as a basis for your own tweaks and additions. The version we ate contained smoked turkey breast which was lovely, but you could use ham or you can also buy Rannoch smoked chicken in Waitrose, which proved just as delicious as the smoked turkey. It was said that Russian housewives would pride themselves on the size of their diced ingredients and while at first I took the lazy route with my chopping, I concede that the smaller you can make your cubes the better it is for eating. Ideally you want eveything to be the size of the peas, but that would be madness to achieve. So just do your best. Russian Salad is good for winter because it’s heartier than your average green salad, and the ingredients are more or less seasonally applicable. Tinned peas are supposedly the most authentic choice, but I’ve tried the recipe with fresh and tinned, and I think both work equally well. By all means feel free to tweak this recipe, if you want to add steamed green beans or spring onions or chives, dill or parsley or all three it would probably taste pretty great. Take care not to over-boil the potatoes and carrots, as this will make them difficult to dice and you want a nice firm texture. Dice everything into 1cm cubes if you can manage it. If everything is diced larger, it makes no difference to the taste. Season and mix everything gently before you dress, as the bits will tumbled about easier without the dressing. Then blend up the mayonnaise dressing to your taste, and then gently fold into the salad. Serve at room temperature if you can. Have just made this salad for tonight’s dinner, tastes absolutely delightful, so easy to make and even managed to dig some potatoes out of the garden. Am about to forward your lovely recipe to my daughter in Vienna and my friend in NZ, as know they will love it too. This is a fabulous recipe to take when asked to ‘bring a plate’ to a BBQ. Will definitely be using this heaps throughout summer. This is such lovely feedback, thanks Lyn and thanks for sharing the recipe with your friends and family.